Weight is always an issue when it comes to lifting and spreader beams. The max. 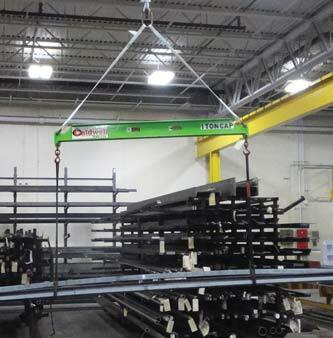 load capacity of your hoist is for everything below the hoist, including the load, the chains, and yes, you guessed it, the lifting or spreader beam. So one way to increase the max. capicity of your overhead crane system is to decrease the weight of the lifting beam – an overall reduction in rigging weight allows for higher load capacities. So if your lift is reaching it’s “max” and that’s not enough, a composite material beam would be perfect way for you to increase your crane’s capacity. Caldwell’s new Dural-Lite beams, just recently released to the market and now available in Canada, has all the features you need for this purpose – it’s half the weight of a steel beam and are available for loads from 1/4 to 3 tons. Composite material beams are made from a high-strength fiber reinforced polymer (or FRP). It’s a lightweight material, that is used in a variety of industries such as aviation, construction, marine and utilities. It’s strength is comparable to that of steel beams while it’s weight is comparable to aluminium. Another major feature of composite beams? They’re non-conductive beams. While not all of our clients require a non-conductive beam those that work around high voltage electricity will appreciate this feature. Another feature that all of our clients will love about this new technology is that it is non-corrosive – a perfect match for outdoor or marine applications. A common concern we’ve heard is in regards to length of service of composite beams. People are worried that it will degrade in a short time yet composite beams are rated for Service Class 4, meaning they are designed for 2 million load cycles! That’s 200 lifts a day for 30 years! So it’s safe to say that these beams are amazingly strong, impact resistant, long-lasting, as well as light and non-conductive for the entire lifespan of your jib crane and overhead lifting system. Extensive internal, external, and third-party testing have proven the products to be, pound-for-pound, one of the strongest lifting beams available today. The best part? If you need custom sizing or have a unique application we will work with you and the manufacturer to design/build a solution to suit your needs. These beams are available up to 3 tons as lifting beams, spreader beams, and adjustable spreader/lifting beams. Contact your Acculift client representative for more information and to schedule a demonstration of this new and innovative product.